For the expansion of your business, Webs Temple service offering you stall designing finds a new avenue with innovative technology and project management. Brand communication reach prime importance when magnetize customer attention during exhibitions. The interest generated in your stall will depend a lot on how your stall looks like. We understand and learn about the product or service & study flow chart and space layout. We organize Stall Design as per client requirements of timeline, quality and cost. 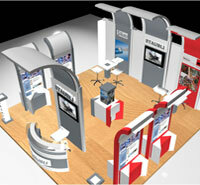 We will provide you with the complete exhibition design solution to your exhibition stand requirements.